In 2002, then Sergeant Major of the Army Jack L. Tilley asked The U.S. Army Band (TUSAB) for volunteers to join a contingent of USO performers for an exceptional opportunity: to travel with his “Hope and Freedom Tour” to entertain deployed troops throughout Southwest Asia during the December holiday season. These volunteers were the first members of “Pershing’s Own” to go “downrange” into a theater of foreign combat operations since World War II. It was during this event that TUSAB became vitally aware of the need to perform the Popular Music of our Troops both overseas and here at home. 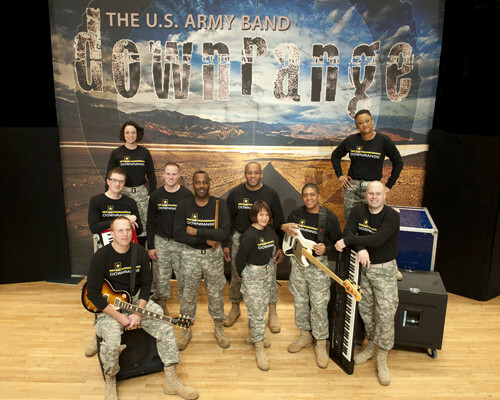 The success of this Sergeant Major of the Army-sponsored boots-on-the-ground mission has become an annual event, and through their performances inspired the new look and sound that is now The U.S. Army Band Downrange. To expand its repertoire, Downrange augmented its vocal and keyboard talent with the permanent addition of a six-piece rhythm section. Today, Downrange enjoys great popularity with its audiences, young and old, through its continuously up-to-date repertoire of rock, pop, country, and R & B, while still inspiring its listeners with signature patriotic arrangements. Downrange embraces TUSAB’s newest mission as a strategic public relations asset for the U.S. Army, and stands ready to entertain audiences at home and around the world. The men and women of Downrange are not just “present and accounted for,” they are constantly on the move and on the frontline — setting the popular-music entertainment standard for The U.S. Army Band and the United States Army.